Make your best steaks taste even better with the Shun Classic 4-3/4" Steak Knife. 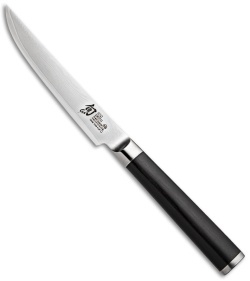 With Shun’s incredibly sharp, clean edge, there’s no tearing, no sawing—and no need for serrations. Because the edge is so sharp, it cuts fewer of the capillaries in the meat and keeps more of the meat juices, which translates to more of the flavor, inside the steak. Once you use a dedicated steak knife, you’ll understand that the right knife really can make an enormous difference in the enjoyment of your meal. The Shun Cutlery Classic knife features a VG-Max "super" steel blade core clad with 34 folded layers per side of stainless Damascus steel. The blade is ground and bead blasted to reveal the beautiful flowing pattern of the Damascus. Each side is sharpened to a 16 degree angle. It features a D-shaped Ebony PakkaWood handle, which is resin-impregnated natural hardwood designed for moisture resistance and longevity. While the D-shaped handle is designed specifically for right-handed use, left-handed users may find it comfortable in hand as well. Shun does sell select left-hand specific handles in the reverse grip.